There’s focus, and then there’s stack focus. Stack focus, which is also often referred to as focus stacking, is a technique that produces close-up images of depth and detail beyond that seen in conventional close-ups. 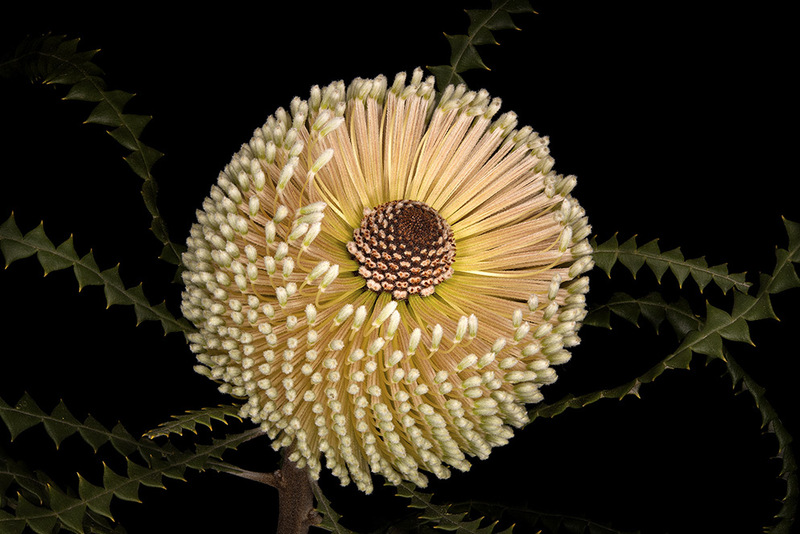 Banksia speciosa, commonly known as the showy banksia, is a species of large shrub or small tree. In Photoshop, David dodged the background to reduce the effect of the flash on them—”I wanted them to have dimension, but not brightness,” he says. What stack focus does is extend depth-of-field in macro photography, and if you’re not familiar with the technique, you might wonder why you’d want to do that. You could set f/11, f/16 or f/22 and get a great deal of depth-of-field. Stack focus, though, is a totally different approach and a means to an end beyond familiar close-up images. Stack focus results in the kind of striking photographs you see here. 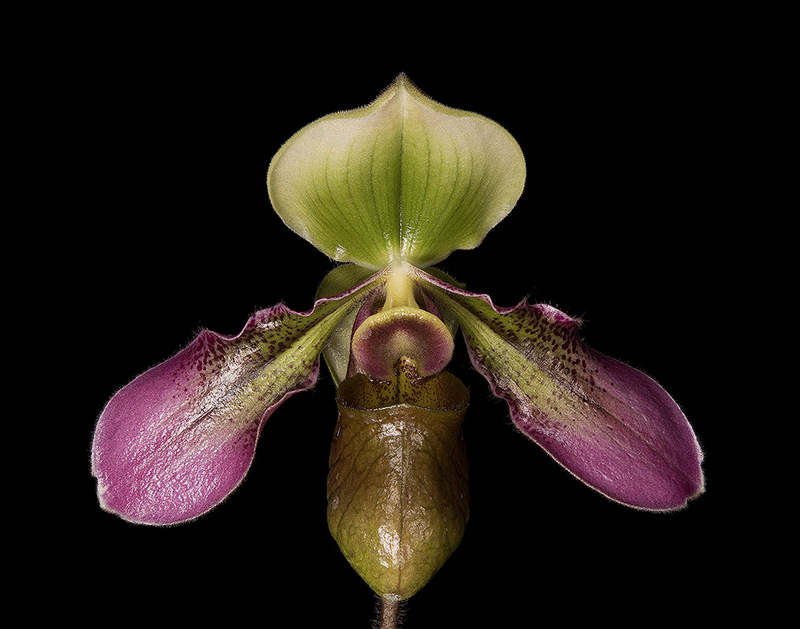 To create them, award-winning fine-art photographer David Leaser took multiple images of his floral subjects at different focus points. Then, using software, he layered the separate photographs to create a revealing, stunningly sharp, detailed composite image. About ten years ago, while shooting landscapes in the Amazon, David found himself captivated by “the tiniest of living things on the rainforest floor,” including the smallest of flowers. Realizing that even the best close-up lenses couldn’t get the depth-of-field he could see in these flowers, not to mention the details even the eye often misses, he started experimenting with stack focus photography. What he wanted to capture and share was “a bee’s-eye view of nature,” and focus stacking was the way to do it. When he first used the technique, he’d mount his D3X and 60mm Micro NIKKOR lens on a motorized rail device that would move the camera and lens toward his subject at preset intervals. The system did the job: the rail moved the camera and lens, in precise increments, closer and closer to the subject, taking pictures at each interval, with each image capturing a different area of focus. Today, David uses the D850 because whether you call it stack focus or focus stacking, the capability is built into the camera. (it’s also in Nikon’s full-frame mirrorless cameras. With the new Z 6 and Z 7 mirrorless cameras, focus shift shooting adds a new feature called “Peaking Stack Images”. This feature, when turned on, will employ focus peaking to create a black-and-white preview stack that can be used to check focus after shooting.) The D850’s stack focus feature moves the elements in the lens; the camera itself does not move. The advantages over the rail system are fewer moving parts, fewer settings, less gear to carry when shooting on location and no need for power cords or batteries for the rail. Using the D850 means the process of taking the individual pictures that will comprise the composite is pretty much automatic. But it’s not push-button automatic—there’s equipment to set up, menu selections to make and test shots to take. But in David’s view, that’s where the creative part of the process comes into play. If you’re interested in creating your own focus stacking photos, or if you’ve been doing it using the motorized rail system and would like to simplify the process, here’s how David gets it done. 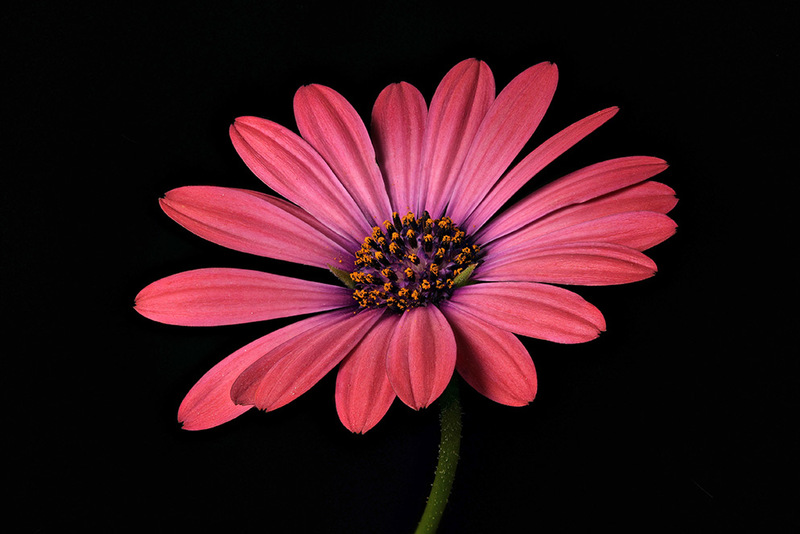 Osteospermum, known as the African daisy, is a genus of the sunflower/daisy family. “This image is one of the collection created at the Huntington the first time I photographed with the D850,” David says. 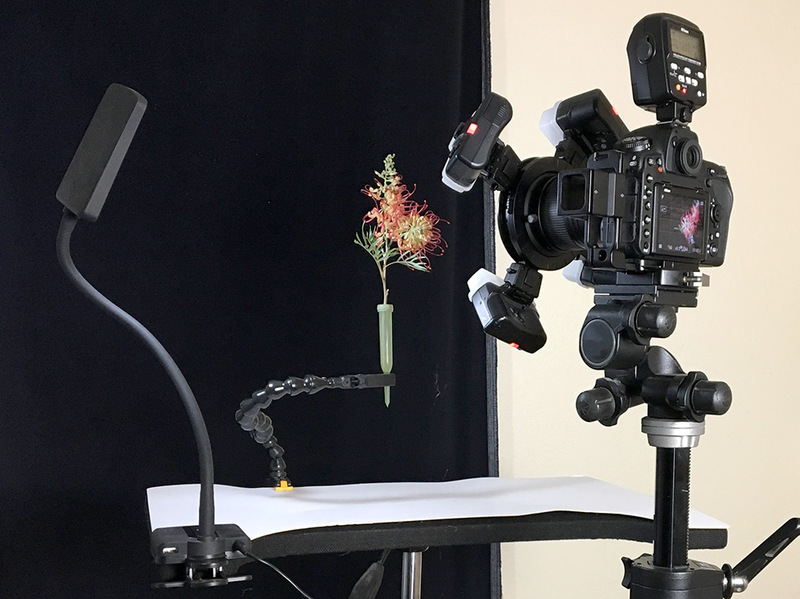 David’s gear for stack focus photographs includes an AF-S Micro NIKKOR 60mm f/2.8G ED lens on his D850; a super-sturdy tripod (it’s a Manfrotto 3251); a small, clip-on LED light; a background surface (he used black velvet for the photos here); and stacking software (his choice among available programs is Zerene Stacker). And one more thing. If you’ve seen the pictures accompanying this article, you’ve probably realized that the most important factor in their creation is light. More precisely, the control of light. David Leaser’s home studio setup with the D850 and 60mm Micro NIKKOR, SB-R200 Speedlights and the SU-800 Commander in place. Note the LED modeling light at left, clamped to an inexpensive tripod, which he uses during focusing, then shuts off before photography begins. He uses Wimberley PP-200 plant clamps “to keep the plants steady and position with precision,” and floral water tubes for single stem cut flowers to keep them hydrated. All the photos with this article were taken with the D850 and the AF-S Micro NIKKOR 60mm f/2.8G ED lens at 1/60 second, f/8 and ISO 64. Everything is controlled from the camera, and getting the camera into stack focus mode is pretty straightforward, though you’ll want to check the D850’s manual, too. First, access the camera’s Focus Shift Shooting menu, which will offer settings for step width, the number of shots and the time interval between shots. Step width controls how far the lens elements will move to photographically get closer to the subject; David selects 3 from the scroll menu. Next, you’ll select the number of shots the camera will take for your composite; David typically chooses from 50 to 125 depending on the size and depth of his subject. Selecting the time interval will determine how much time will elapse between shots. “That’s important because the flash units recycle very quickly, but you do have to allow for that,” David says. He sets that menu to 00, which is the default for five-frames-per-second. 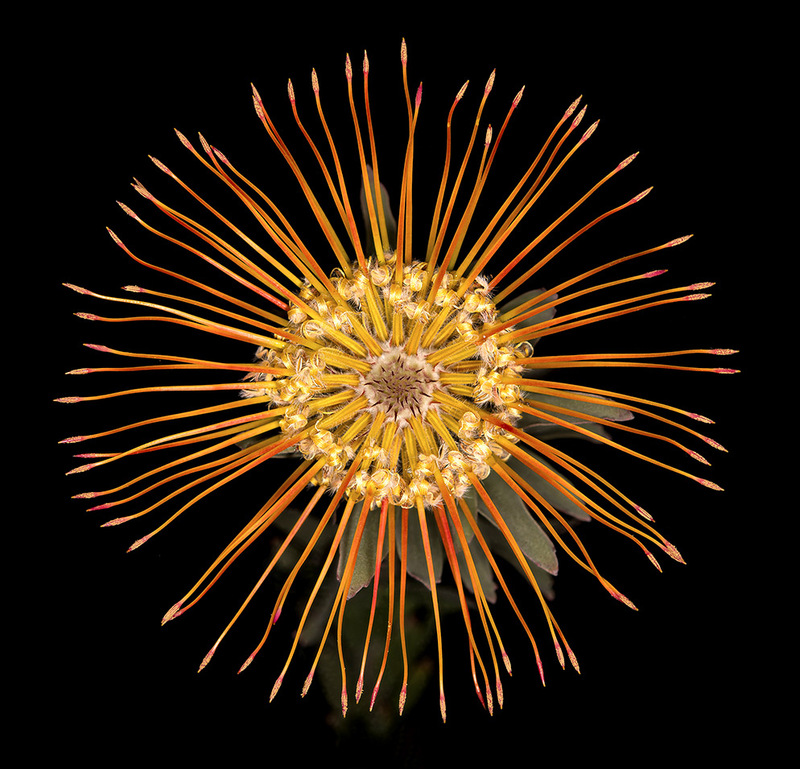 A Goldfinger pincushion protea flower, a genus of South African flowering plants, sometimes also called sugar bushes. David didn’t use the entire stack of images here because the green leaves behind them looked so distracting he deleted the last images in the stack—the sharp frames—leaving the early blurry ones to soften the leaves’ overall effect in the photo. Camera battery at full charge so you’re sure to capture 120 or more shots. VR off because the camera’s on a tripod. David’s standard settings for his stack focus photography are 1/60 second, f/8, ISO 64. In the Focus Shift Shooting menu, be sure the Silent Photography option is off. If it’s on, it will disable flash photography. David suggests turning on Exposure Smoothing—the setting’s available in the Focus Shift Shooting menu. “Smoothing results in smoother, more consistent exposures,” he says. Movement. You don’t want any. Not when flowers or plants are your subjects. Heat coming up in the room, the air conditioning kicking on, air seeping through drafty window frames—the delicate parts of the flowers and plants will move. “A typical session takes about 15 minutes,” David says, “and I’m always thinking about air movement, my movement and camera shake. And a flower is a living thing, and living things move on their own. A flower starts to wilt as soon as you pick it, and I do these photographs in a dark room because if a flower sees light it will move toward it.” In addition, he brings his subjects into the dark room for anywhere from a half to a full day before photography to acclimate them to the dark. How much time before depends on the flower and how perishable it is. A little research and experience with your subject will go a long way to determine acclimation time. 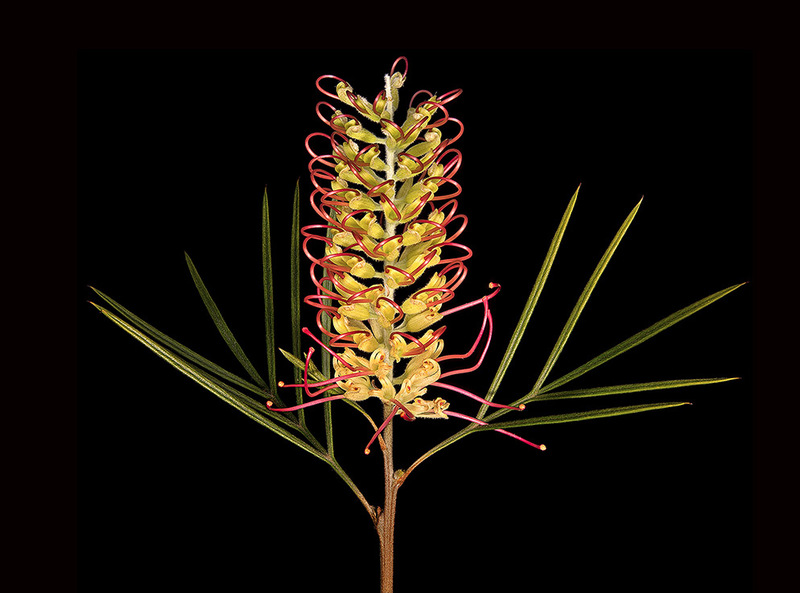 Finally, focus stacking isn’t limited to flowers and plants or the great indoors. Subjects include insects, butterflies, coins, stones, tree bark, jewelry, seashells, rock formations and pretty much any found objects with complex structures and textures. The familiar made magical awaits.